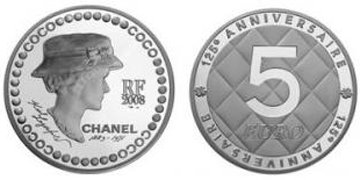 Perhaps I’ve been hiding under a rock for the past two years, but a few months ago I found out about these stunning Chanel coins. Now I’m no numismatic, but I sure would like to be the proud owner of one of these beauties. They were made in both gold and silver, and no, I don’t mean in color, I mean the real deal. While they appear to be a €5 coin, they actually sold for a lot more because they are made of gold and silver. 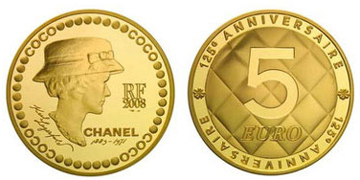 There were 99 gold coins produced, which sold for €5,900 (so you could potentially spend one of these €5 coins in Chanel boutique) . There were 11,900 silver coins produced, which retailed for €45. 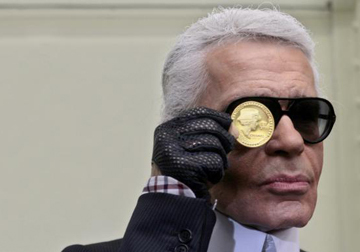 The coins were designed by Karl Lagerfield (note his signature on the front) in honor of Chanel’s 125th birthday. These coins were released in December of 2008, so I’m sure if you’re able to find them now, you’re going to pay a premium. You will notice Gabrielle “Coco” Chanel on the front and the iconic 2.55 quilted pattern on the back. 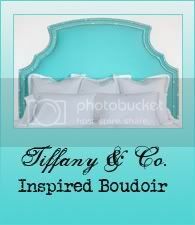 Are any of you boudoir beauties a possession of such a treasure?